BMW has made a big deal of its plug-in hybrid (PHEV) and electric vehicles (EV) at the Geneva Motor Show, with the main news being the introduction of a PHEV version of the X3 SUV. Production of the X3 xDrive30e will begin in December this year, with a 2.0-litre, four-cylinder TwinPower Turbo petrol engine augmented by an electric motor. Peak system power will be 252hp, but BMW says an 'XtraBoost' function can see the electric motor bump this figure up by 41hp for a limited period. Power goes to all four wheels through an eight-speed Steptronic automatic gearbox and BMW says the 30e can do 0-100km/h in 6.5 seconds, all while returning 2.4 litres/100km (117.7mpg) with CO2 emissions of 56g/km (all WLTP). The lithium-ion battery is positioned under the rear seat to save space, but the xDrive30e's cargo capacity of 450 litres is 100 less than the regular X3's. An all-electric range of 50km is promised. 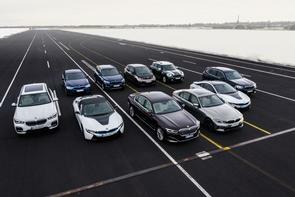 Alongside the X3 PHEV, BMW also revealed some of its 'second-generation' plug-in hybrids, such as the new 330e. It uses the same 252hp + 41hp drivetrain as the X3 and can go up to 60km on a charge, which BMW says is 50 per cent more than its predecessor. Fuel consumption is as low as 1.7 litres/100km (166.2mpg) with CO2 emissions of just 39g/km, while the 0-100km/h time is 6.0 seconds flat. Meanwhile, the BMW X5 and 7 Series PHEVs gain the inline-six, 394hp petrol-electric drivetrain that's already been confirmed for the 745e. This results in the X5 xDrive45e running 0-100km/h in 5.6 seconds, having an electric range of 80km (almost three times the preceding xDrive40e's EV distance) and returning eco-stats of 2.1 litres/100km (134.5mpg) with 49g/km CO2. Boot space is down to 500 litres, which is smaller than a regular X5's boot, but still pretty capacious. As to the 745e, we've already brought you the rundown on that - click the '745e' link above for details. Finally, the existing 530e and 225xe Active Tourer PHEVs gain the latest development of lithium-ion batteries, increasing their all-electric range. The Five's battery has increased in energy capacity from 9.2- to 12kWh, resulting in 30 per cent more EV range for a grand total of 64km on the WLTP cycle. That means 1.7 litres/100km (166.2mpg) and 38g/km CO2, while BMW has confirmed an all-wheel-drive variant called the 530e xDrive will come onstream from July 2019 onwards - this manages 57km on electric power, 1.9 litres/100km (148.7mpg) with 44g/km CO2. Meanwhile, the 225xe's figures see the battery go from 7.7- to 9.7kWh, meaning 25 per cent more EV range at 57km in total. Fuel consumption is 1.9 litres/100km (148.7mpg) with 43g/km of CO2. All BMW PHEVs make a distinctive noise in EV mode, by the way, to warn pedestrians they're moving.